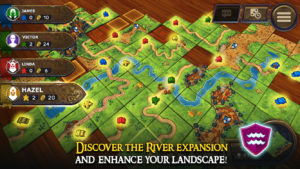 Carcassonne’s[Tiles & Tactics] New 3D Version Is Now Out For Android And Steam With Two Expansions: The River And The Abbot. Asmodee Digital Has Just Released The New Version Of Carcassonne, Board Game In Google Play Store. The New Version Is In 3D, Includes Improved IA, And Some New Exclusive Features. If You Don’t Know About Carcassonne/How To Play – In Carcassonne, Player Use Tiles To Collectively Build Up A Kingdom Of Cities, Roads, Monasteries, And Farms. You Win By Scoring The Most Points, Earned By Sending Your Followers To Claim Parts Of The Kingdom You And Your Fellow Players Have Built. You Draw Tile And Place It On Landscape. Place As A Farmer On The Grass, Or As A Robber On The Road.When That Area Is Complete, That Meeple Scores Points For Its Owner. Carcassonne Is A Fast Paced Game And If You’re Not Paying Attention, It Can Run Away From You. New Version Comes With 2 Mini Expansions – The River And The Abbot. You Can Play Solo, Pass & Play On The Same Device With Your Friends Or Play Online – Play With Players All Around The World, Or Play Private By Inviting Your Friends. Size – 40MB[Approx. ]/Varies, Price – Paid[$1.99], Download – Here[Google Play Store].